Interaction at El Carrito, the portable neighborhood planning cart. 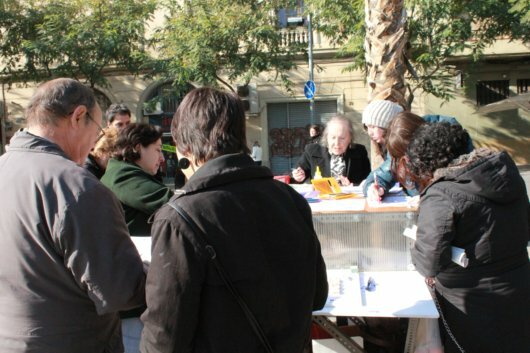 On Saturday, January 29, I joined Raons Publiques at Plaza Fort Pienc with El Carrito – a mobile public participation cart on wheels — once more. Although the members of Raons Publiques first brought El Carrito close to the soccer game across the Marina Street and began engaging residents to participate there, the lack of people convinced them to return to the most successful public place in the barrio (neighborhood), Plaza Fort Pienc. It is ironic that often, in order to gain the necessary participation that will help launch the creation of new successful public spaces, such a space needs to already exist to some degree. However, even in a populated public space, participation from the public is not always easy. As such I am anxious to see how the methods of engagement develop over time. Although I arrived at half past eleven, we did not see the first participants until a quarter to one. Soon after the first couple began telling stories about their lives in the neighborhood. An older gentleman began speaking with Eva, and before long everyone was engaged with at least one participant. The presence of some participants draws more. The same, however, is not true for the amount of volunteers at any given time. Too many volunteers actually creates an insular atmosphere, rather than an open one, around El Carrito. Too few, and a strain is placed on the volunteers present. In addition, it is increasingly evident that the qualitative aspects of space often require the exchanges gained from conversations that go beyond simply filling out forms; talk about space transforms into stories and narratives, which is not easily communicated through simple surveys. The passionate demeanor of neighborhood people in conversation creates an atmosphere of possibilities. And so, although one volunteer might be able to manage the intake of forms filled out by the residents, they would lose out on the spontaneous exchange that results from dialogue. One of the surprising aspects of today’s activity actually came during the lulls in public participation. It was at this time that all of us in the group started brainstorming about how to improve the process. The middle of the plaza is an ideal venue in which to consider how to engage people in that very space. And so, even though we did not collect as many documents from the public this day, the entire endeavor continues to evolve in intriguing ways. One aspect of public space that began to really take shape for me was the methods by which people understand public space. 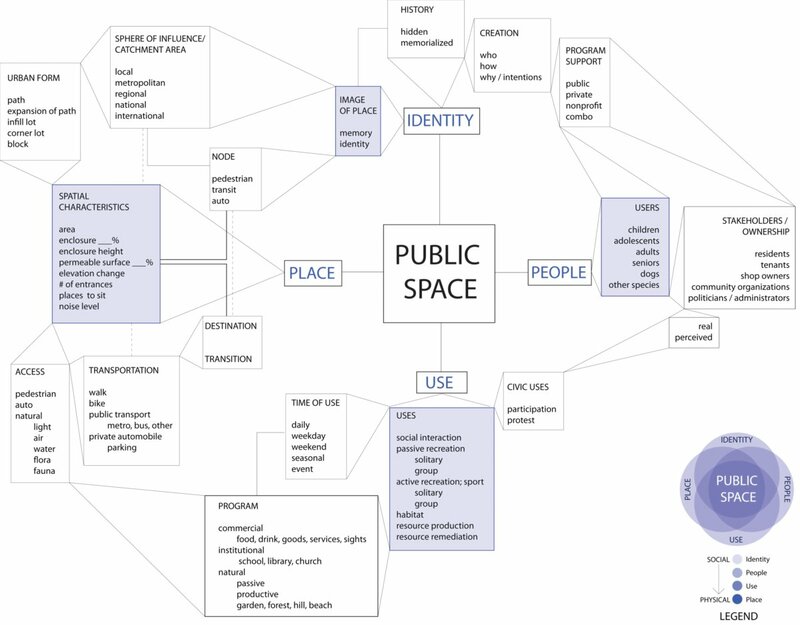 Public space (social, civic, democratic, pluralistic) is such a diluted term that it fails to communicate with precision. In many ways, I cannot say what public space is, only what it is not: private property. Of course, upon closer inspection this also fails, since plenty of public events of social interaction occur in privately-owned spaces transformed into public space for certain periods of time or events, like a dinner party or an outing to the movies. And then there are the private enterprises, such as cafes and restaurants that contribute social interaction to a space otherwise lacking such activity; blighted public space can hardly be considered social. Another example of the complexities comes from Barcelona and the Eixample area that was designed to include a public court in every one of its famous chamfered edge blocks; this rule has been maintained as far as property owners abiding by the easement and not building within the allotted public court. However, since no provisions were made regarding public access to this public court, many of these intended public spaces remained inaccessible until the establishment of ProEixample, a public society working with private and public authorities to reclaim these spaces for true public use. SpatioSocioGram, version one. Click here to see a larger version. Suffice it to say that the possibilities of public space are endless. As such, it is not necessary to try to formulate a comprehensive understanding, especially since the element of spontaneous activity is also a productive element of public space that resists strict labeling; rather, I hope to begin a categorization of the types of public spaces found in the Fort Pienc neighborhood in Barcelona. Plan of Public Spaces in Fort Pienc. Click here to see a larger version of this image. SpatioSocioGram, version two. Click here to see a larger version of this image. 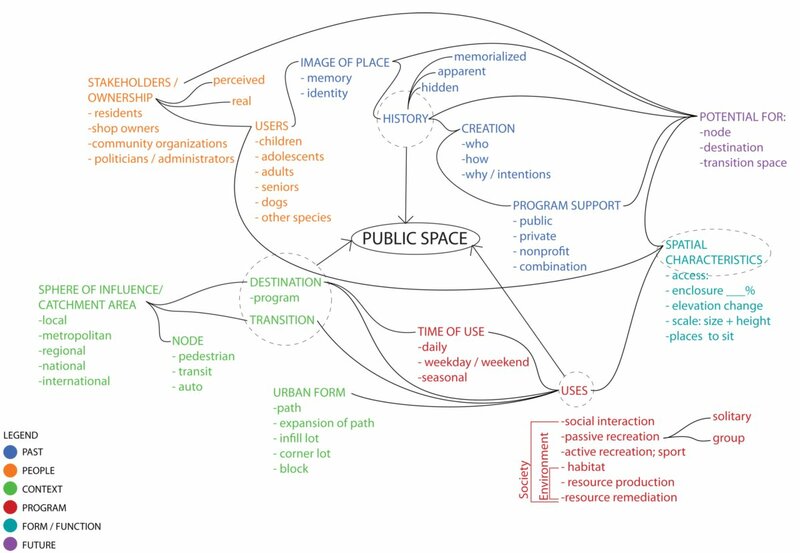 The objective of this categorization is to combat the general, vague perceptions of public space and, instead, to be precise in the terms of description. 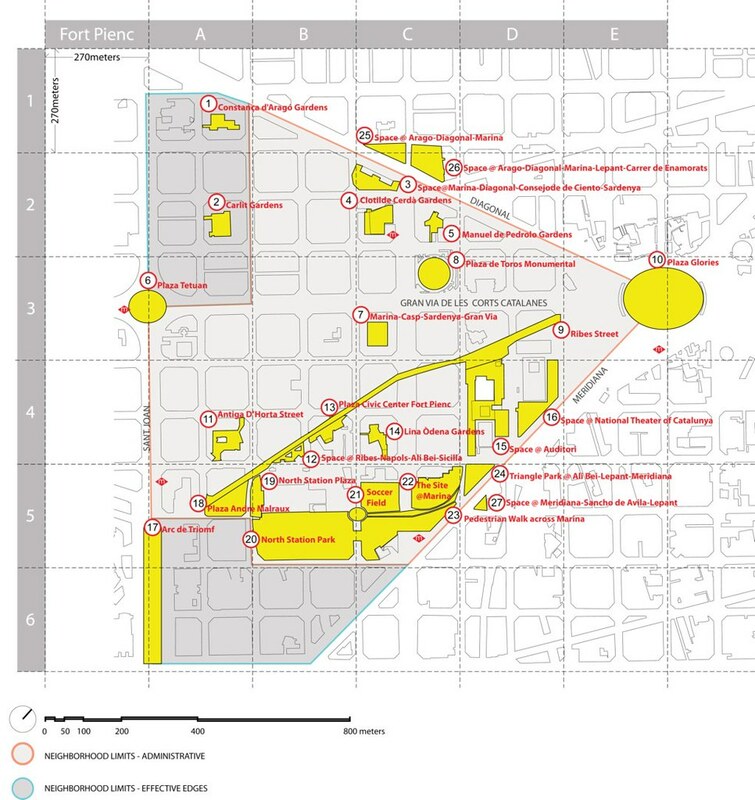 These diagrams will be used to analyze the main public spaces in the Fort Pienc neighborhood. The level of study in each of these categories is still open, and only time will tell the depth and breadth of research undertaken. In 1867, Catalan engineer and urban planner Ildefons Cerdà famously declared the need to “urbanize the rural areas and ruralize the urban area.” MIT student Valeria Alonso wrote a thesis documenting Cerda’s studies and observations in the 1850s of the rapidly industrializing city of Barcelona. Along similar lines that strive towards a cross-fertilization of elements previously understood as discrete, these diagrams are a beginning to spatialize the social and socialize the spatial. Post and images by Claudia Paraschiv. For more information on her work in Barcelona, read her blog, http://learningfrombarcelona.wordpress.com/.